Drug overdose deaths have more than doubled nationwide in the last 16 years, but not in New Jersey. 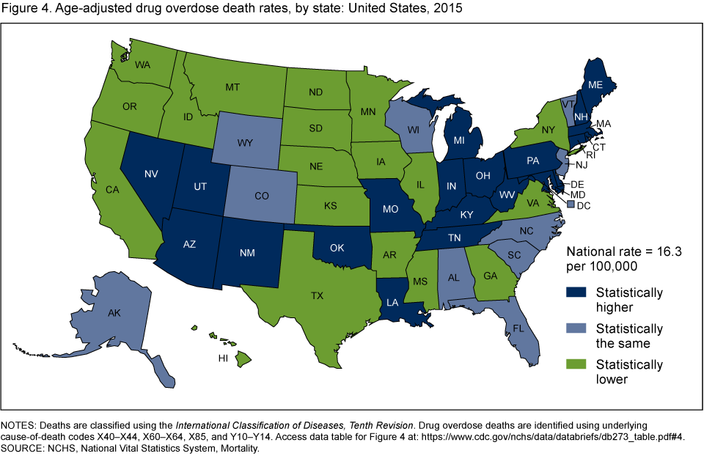 While both Pennsylvania and Delaware have seen rates climb since 1999, New Jersey's overdose death rate has remained steady over the years, according to a recent Centers for Disease Control study comparing rates during the period. Heroin is the main culprit, tripling as the cause of death, but natural and semisynthetic opioids, like Oxycontin, are right behind, followed by synthetic opioids. Methadone is the one drug where there has been a decrease. Today, non-Hispanic whites are dying from overdoses at 3.5 times the rate of 16 years ago. The age group with the greatest percentage increase in overdose mortality is now aged 55 to 64. Pennsylvania’s rate of OD deaths puts the Keystone State at number five in the nation for drug deaths. Delaware makes the top 20 list for OD deaths. New Jersey’s rate, on the other hand, has remained fairly level. And drug mortality is down in 19 states. Pennsylvania's drug deaths are way up over 16 years, New Jersey's remains about the same, and some state have managed reductions. Dr. Priya E. Mammen, an emergency medicine physician at Thomas Jefferson University Hospital, sees the heroin and opioid crises in real-time. "Overdoses are more intense and more frequent," says Mammen, a member of Philadelphia’s Task Force to Combat the Opioid Epidemic. She's been in practice as an ER doctor for a decade. Today she sees patients who require multiple doses of naloxone, an antidote, because they have ingested other drugs or alcohol at the same time. Philadelphia's heroin is known for its cheapness and purity, far cheaper than prescription opioid pills, she said, adding that she knows from sharing local data with other ER doctors that pill deaths are down in the city, while heroin mortality is up. Locally, emergency room physicians used data they shared to develop their own protocols to reduce a reliance on pain pill prescriptions, years before similar guidelines were adopted nationally. Mammen added that when new product hits the street, users often have adverse reactions because it may have additives and is not what addicts are accustomed to using. While she has seen patients in North Philadelphia and South Philadelphia, one constant is that heroin is a particular problem among the city's white population. She surmises that the increase in mortality among an older population from 16 years ago is due to its experience with chronic pain, which can lead to a pill dependence that outlasts their initial pain problem. •	The age-adjusted rate of drug overdose deaths in the United States in 2015 (16.3 per 100,000) was more than 2.5 times the rate in 1999 (6.1). •	Drug overdose death rates increased for all age groups, with the greatest percentage increase among adults aged 55–64 (from 4.2 per 100,000 in 1999 to 21.8 in 2015). In 2015, adults aged 45–54 had the highest rate (30.0). •	In 2015, the age-adjusted rate of drug overdose deaths among non-Hispanic white persons (21.1 per 100,000) was nearly 3.5 times the rate in 1999 (6.2). •	In 2015, the percentage of drug overdose deaths involving heroin (25%) was triple the percentage in 1999 (8 percent). • In 2015, 21 states had age-adjusted drug overdose rates that were statistically higher than the national rate. •	Other states with rates that were statistically higher than the national rate of 16.3 per 100,000 included Rhode Island (28.2), Pennsylvania (26.3), Massachusetts (25.7), New Mexico (25.3), Utah (23.4), Tennessee (22.2), Connecticut (22.1), Delaware (22.0), Maine (21.2), Maryland (20.9), Michigan (20.4), Nevada (20.4), Indiana (19.5), Louisiana (19.0), Arizona (19.0), Oklahoma (19.0), and Missouri (17.9). • Deaths from drug overdose involving heroin tripled nationwide from 8 percent in 2010 to 25 percent in 2015. New Jersey Gov. Chris Christie has made substance abuse a centerpiece of his last year as governor. He signed reforms into law last month, limiting the dispensing of opioids and expanding treatment. Tom Wolf, the governor of Pennsylvania, has talked up reforms, but has not made headway with the state legislature and reforms have stalled.